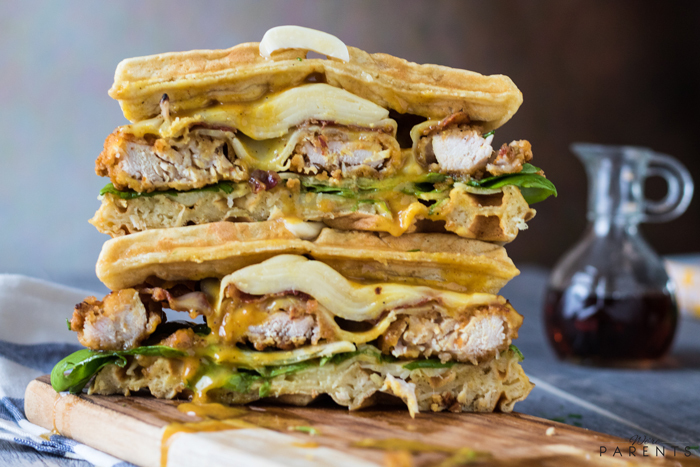 This chicken and waffles grilled cheese sandwich is the ultimate chicken and waffles sandwich. No matter, if you’ve had the infamous chicken and waffles (with hot sauce or gravy depending on your location), you’ll want to dive into this grilled cheese sandwich immediately! It’s Gourmet Grilled Cheese Week here on our site and we know you are ready for more deliciousness. We are so excited to jump right into giving you another mouthwatering grilled cheese recipe too. Today, we present the chicken and waffles grilled cheese recipe. Now, depending on where you live, you may have chicken and waffles served with hot sauce, or a spicy syrup, or you may have it served with mashed potatoes and gravy. Either way you prefer it, it’s all delicious. And, if you’re on the fence about trying it, just stop. Chicken and Waffles may sound like an odd combination, but really it’s not. Sweet bread and deliciously fried chicken go hand in hand. 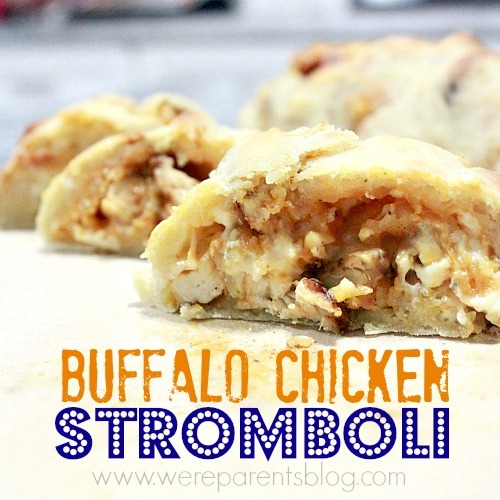 Even syrup drizzled across the chicken is a delicious idea…I PROMISE…I would never lie to you guys. 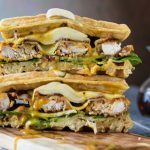 This chicken and waffles grilled cheese recipe takes two Belgian waffles (we use this waffle maker) and cooks them in a skillet with butter for a few minutes. Then, in between them layers a copious amount of mozzarella cheese, fried chicken tenders, crispy bacon, lettuce, and our own honey mustard BBQ sauce. Once layered, we put this grilled cheese in the oven and bake until it’s all warm and has melty, gooey, cheese. After that, you want to cut it in half down the middle, making two sandwiches. Serve alongside maple syrup for dipping. It was so delicious and a must try for everyone. What is a good side dish for chicken and waffles? While we believe that this grilled cheese sandwich could be served entirely on it’s own, we know some may want some ideas for sides that would be great on this! No matter what you decide to serve alongside it, this is one of the best grilled cheese recipes that you are going to find around. 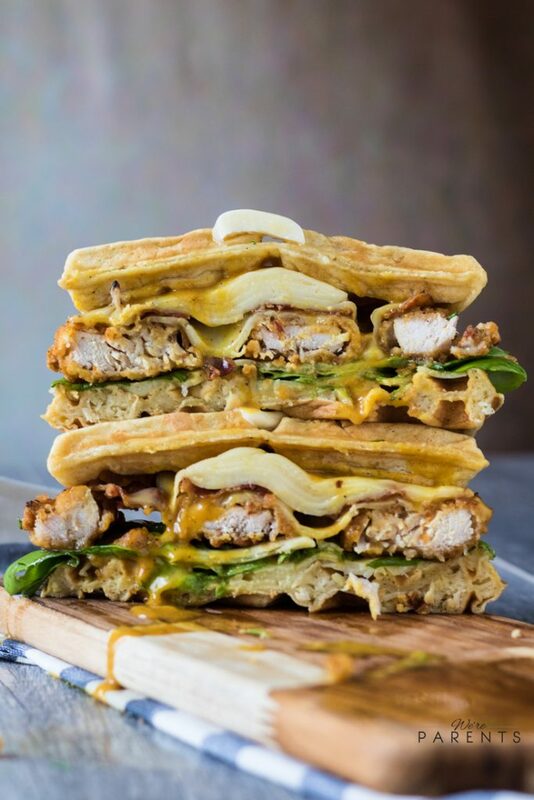 This chicken and waffles grilled cheese sandwich is the ultimate chicken and waffles sandwich. 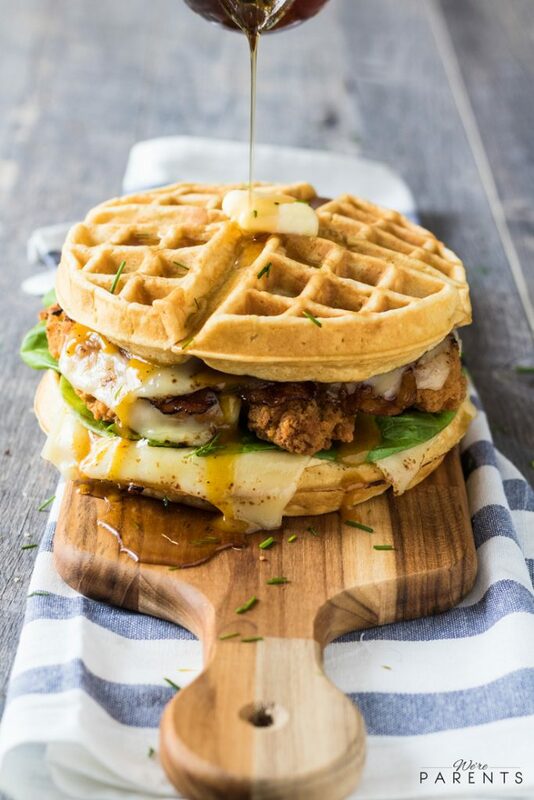 No matter, if you've had the infamous chicken and waffles (with hot sauce or gravy depending on your location), you'll want to dive into this grilled cheese sandwich immediately! 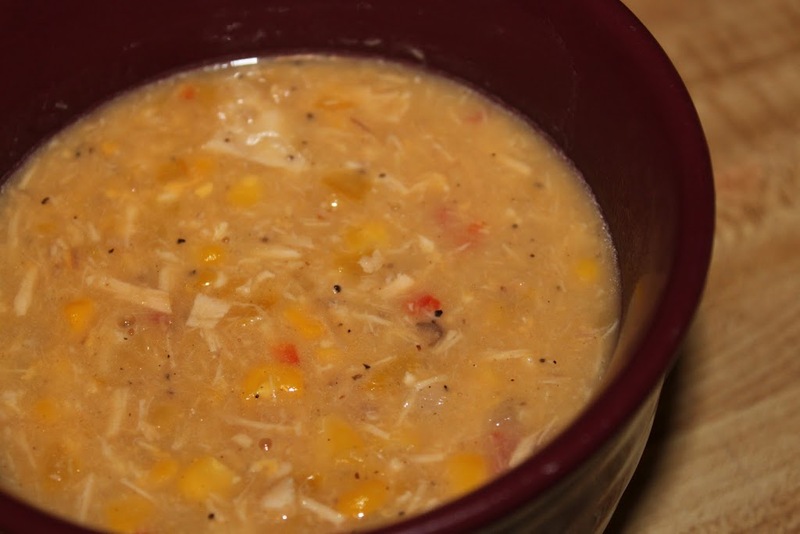 Remove from heat and layer 3 slices of cheese, remaining ingredients, and remaining cheese. Place sandwich on a baking sheet and place in oven for 7-10 minutes or until warmed and cheese is melted. Remove from oven and slice in half to make 2 sandwiches. *Nutritional facts are only estimates. Please use your own ingredients to get a more definite amount. Syrup not included in estimates. 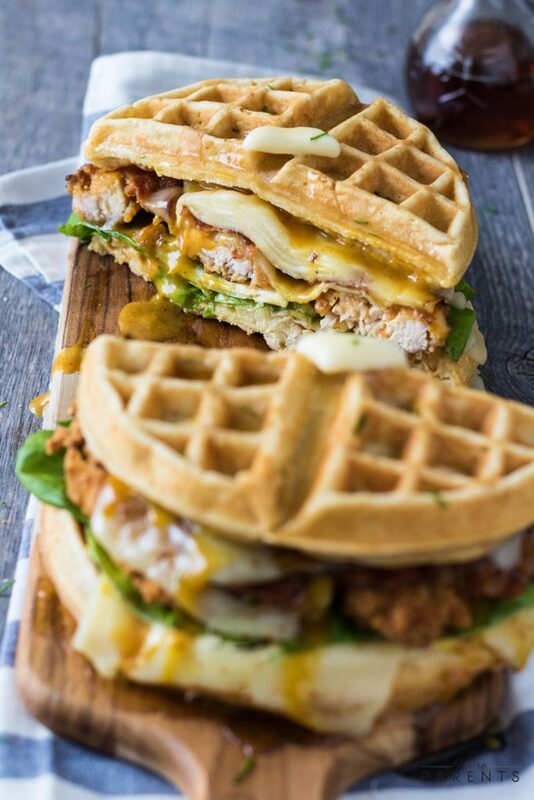 Pin this Chicken and Waffles Grilled Cheese Sandwich for later!